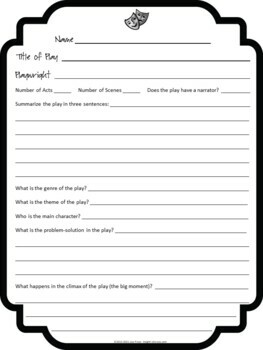 This activity is great for Language Arts and drama teachers, and is designed for grades 5-9. 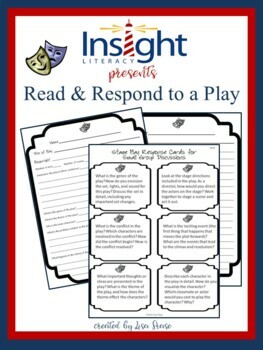 Included in this packet: 12 discussion cards, a page with basic questions (for any play), and a personal response page (initial page, plus an extra page for additional writing). 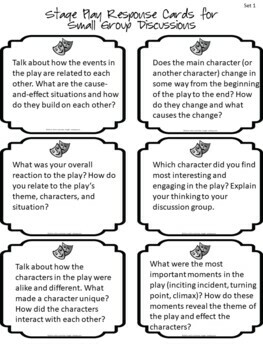 Students read a play, complete the questions, discuss the play with their peers, then respond to the play. You can use all or part of this activity with your lesson. 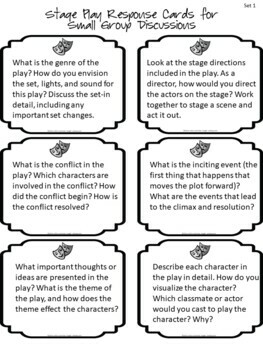 Prior expectations - Students need to have experienced prior lessons on parts of a play, theme, cause and effect, inciting incident, turning point, climax, resolution, characters, and conflict in order to thoroughly discuss and answer questions.